New Mexico State University will host a two-day acequia symposium focused on “Acequias and the Future of Resilience in Global Perspective,” March 2-3 at the Las Cruces Convention Center, 680 E. University Ave. in Las Cruces, NM. 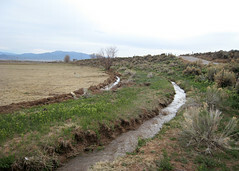 According to organizers, acequias are an age-old system of ditch irrigation—and social organization—especially prevalent in the northern part of New Mexico. "Given the similarities among ditch irrigation systems in many parts of the world, we have developed a program with international scope," said Dr. Sam Fernald, New Mexico Water Resources Research Institute interim director and a professor in New Mexico State University's Department of Animal and Range Sciences. "We are looking for clues to sustainability from our acequias here in New Mexico and their analogs around the world. Presenters will address issues relating our system to ones in Mexico, Peru, Chile, Spain, Morocco and Bali." For more information and to register, visit globalperspectives2013.wrri.nmsu.edu.